The kinkajou is a rainforest mammal of the family Procyonidae related to olingos, coatis, raccoons, and the ringtail and cacomistle. It is the only member of the genus Potos and is also known as the "honey bear" (a name that it shares with the sun bear). Kinkajous may be mistaken for ferrets or monkeys, but are not closely related to either. Native to Central America and South America, this mostly frugivorous, arboreal mammal is not an endangered species, though it is seldom seen by people because of its strict nocturnal habits. However, they are hunted for the pet trade, for their fur (to make wallets and horse saddles) and for their meat. The species has been included in Appendix III of CITES by Honduras, which means that exports from Honduras require an export permit and exports from other countries require a certificate of origin or re-export. They may live up to 40 years in captivity. An adult kinkajou weighs 1.4–4.6 kg (3–10 lb). The adult body length is 40–60 cm (16–24 in); in addition to body length, the length of the prehensile tail is 40–60 cm (16–24 in). 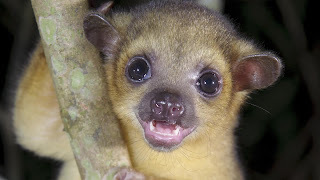 Although the kinkajou is classified in the order Carnivora and has sharp teeth, its omnivorous diet consists mainly of fruit, particularly figs. Studies have shown that 90% of their diet consists of (primarily ripe) fruit. To eat softer fruits they hold it with their forepaws, then scoop out the succulent pulp with their tongue. They may play an important role in seed dispersal. Leaves, flowers, and various herbs make up much of the other 10% of their diet. They sometimes eat insects, particularly ants. It has been suggested, without direct evidence, that they may occasionally eat bird eggs and small vertebrates. Their frugivorous habits are actually convergent with those of (diurnal) spider monkeys. 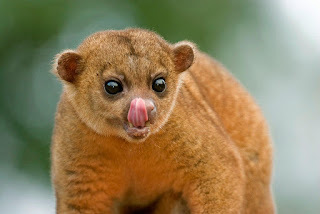 The kinkajou's slender five-inch extrudable tongue helps the animal to obtain fruit and to lick nectar from flowers, so that it sometimes acts as a pollinator. (Nectar is also sometimes obtained by eating entire flowers.) Although captive specimens will avidly eat honey (hence the name "honey bear"), honey has not yet been observed in the diet of wild kinkajous. Kinkajous range from east and south of the Sierra Madres in Mexico, throughout Central America to Bolivia east of the Andes and the Atlantic Forest of southeastern Brazil. Their altitudinal range is from sea level to 2500 m. They are found in closed-canopy tropical forests, including lowland rainforest, montane forest, dry forest, gallery forest and secondary forest. Deforestation is thus a potential threat to the species.